Watch the video above to learn how Accordion Life will help you learn the accordion. ♦ Understand how to play the bass buttons with good technique. ♦ Eliminate the frustration of not know if you’re doing it right. ♦ Learn various bellow techniques including the bellow shakes and vibrato. ♦ Learn how to use the left arm to produce quality sound. ♦ Learn tips and tricks to coordinating both hands together. ♦ Have an easy step-by-step instruction on how to play the piano accordion. If you want to learn how to play the piano accordion, save valuable time, and have clear step-by-step instructions with all materials included, you are in the right place! There are lots of “how-to” YouTube videos available but having an organized step-by-step program from an award-winning teacher will ensure you make progress quickly and accurately. Get a fully structured course of video lessons designed to work as a curriculum. You won’t get a mishmash of random lessons that leave out vital beginner techniques or knowledge. You won’t be confused about what to learn next. You’ll see exactly how to do the technique correctly and hear the subtleties of how you should be sounding. All videos are professionally produced with multiple camera angles giving you up- close and personal viewing of what we are doing. You’ll never have to wonder what buttons or keys to press or how it is supposed to sound. We demonstrate everything! You’ll feel confident knowing you are taking the pathway that will enable you to play well. 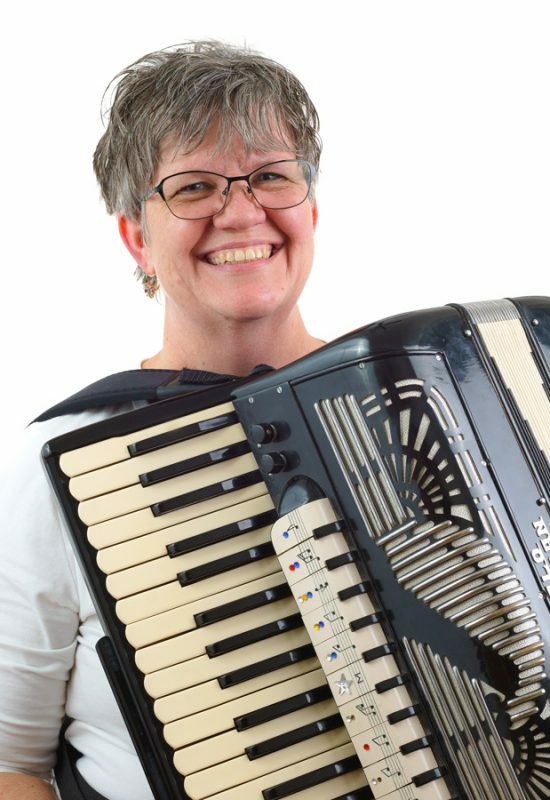 My name is Patricia Bartell and I am an accordion teacher, performer and international adjudicator. Over the last 20+ years, I’ve helped hundreds of students learn to play the piano accordion and most importantly develop a passion for playing music. Our students are solid musicians who are able to express music beyond the written notes on the page. Learning the mechanics of music and the instrument is just the beginning. Along my journey have I met many people couldn’t find a good accordion teacher in their area so they tried to learn the accordion on their own. As a result, they found that learning can be slow and frustrating if you learn the wrong way. I developed Accordion Life so anyone could be able to play the accordion and have access to quality education (that is available 24/7). Accordion Life provides everything beginning to intermediate students needs to play the accordion. For advanced students, we offer private Skype lessons. ♦ B.A. in Music Education & Accordion Performance. 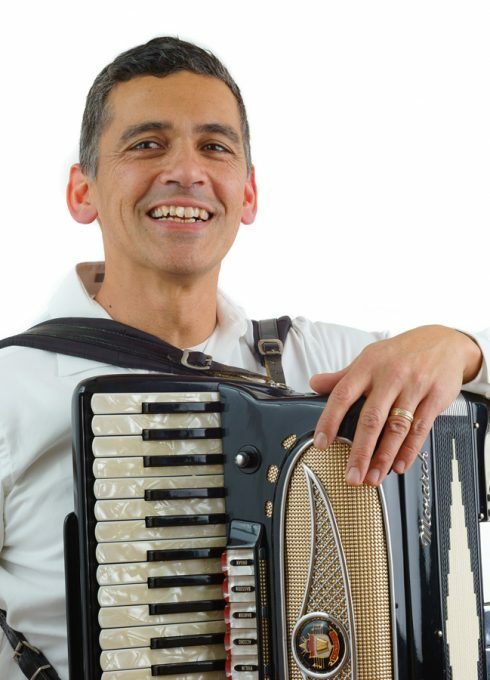 ♦ Successful International Award-winning Accordion Competitor & Concert Artist. ♦ USA Adjudicator for Trophee Mondial of the World Accordion Confederation. ♦ Owns, manages, and teaches at Bartell Music Academy. ♦ Performs with Tango Volcado, an Argentine Tango Quartet. ♦ Discover exactly how to get started correctly and if you have some experience you’ll be able to fill in any gaps in your learning and technique. This will make sure you have a solid foundation so you can advance quickly and further. ♦ Understand exactly how to play the keyboard of the accordion with good technique so you have control over every note and its sound. Piano technique and Accordion technique for the keyboard are two completely different techniques. ♦ Learn to play the bass buttons with a good sound and know which fingers to use. ♦ Build solid bellow control that will make your music sing. ♦ Skip past all the mistakes and obstacles that keep MOST beginning accordionist from advancing quickly and playing with accuracy. Rewind and repeat each video or section as often as you want, whenever you want! “I love your teaching methods. I’m a 66-year old Polish boy who took accordion lessons when I was 6 for a year or two, then quit, which I have regretted all my life. Now, I really want to get as good as I can with the accordion. I’m really impressed with your program.” – Joe W.
As a member of Accordion Life, you will have access to an incredible suite of learning tools. From technique lessons to video tutorials on a specific piece of music, you will be amazed at the amount and quality of material available to you. To guide you through the lessons you will be using a step-by-step curriculum that is structured and goal oriented. There are four levels (Preliminary Level, Level 1, Level 2, Level 3) that take you from complete beginner material through to intermediate lessons. Learn on any device. Watch your video lessons on your computer, smartphone or your favorite tablet. For complete beginners: learn how the piano accordion works and how to handle it properly. This course prepares the absolute beginner with a working knowledge of accordion care. The Level 1 Course covers core techniques that are used in accordion playing. Techniques such as bellow rules, standard bass patterns and producing quality sound are all covered. In addition to technique, you will learn how to read music, get an introduction to music theory and musicianship. Repertoire has been carefully selected to help you progress without frustration. You will have lessons on all of the repertoire in level one to further use your new found technique skills. Level 2 picks up where Level 1 left off and continues in a progressive and structured fashion. Learn to produce different articulations, bass rhythms and develop bellow control. You will find the same comprehensive approach which includes technique, repertoire, theory, and musicianship. The repertoire continues to progress steadily in difficulty in Level 2. Level 3 is for the early intermediate accordionist and includes repertoire Dark Eyes, Tico Tico, Under Paris Skies, Boogie Sphere and more. Learn the bellow shakes, a variety of rhythm patterns, bass development and other special effects. A step-by-step program with videos that are professionally produced with multiple camera angles giving you up- close and detailed views. Not only do we show you what to play and demonstrate every song, all the sheet music is available for downloading and printing so you can follow along easily with the videos. The Study Sheet documents contain important elements from each lesson that will serve as a quick reference so you’ll easily remember the main components of each lesson. All the sheet music inside the courses is digitized. This allows you to watch the notation and listen to the songs for the right or the left hand in slow or fast speeds. This digital player will loop a measure so you never have to wonder if you’re playing the correct rhythm or notes. Get access to the forums and social groups so you will never feel alone following your passion. You’ll have friends who understand your love for the accordion and support you. Getting encouragement and having your own “fans” cheering you on will make you feel inspired and excited to be a part of Accordion Life. In addition to the Main Courses, you’ll have access to another hundred videos that demonstrate and show you how to play many other types of songs giving you a variety of music to have in your repertoire. When you want to find and explore other music that keeps within your current playing “level” these single song tutorials will fulfill that desire to expand your repertoire. After your first complete month with Accordion Life, you’ll get a discount code that will give you a 50% discount on all future “specialized” courses as a way of saying thank you for being part of the Accordion Life team. You’ll be the first to know when these special courses are ready. Even before they get announced to the public you’ll be the “first to know” about them. Staying ahead of the crowd and know being part of the Accordion Life team has its special perks. Accordion Life Today is an educational digital accordion magazine that is full of articles of accordion history, technique, stories, music theory, sheet music and more! As a member, you will have access to all past archives. Bonus #4: Personal Feedback from Our Teachers for 4 Weeks. Submit any videos or questions of your playing for feedback from any of our experienced Accordion Life teachers. 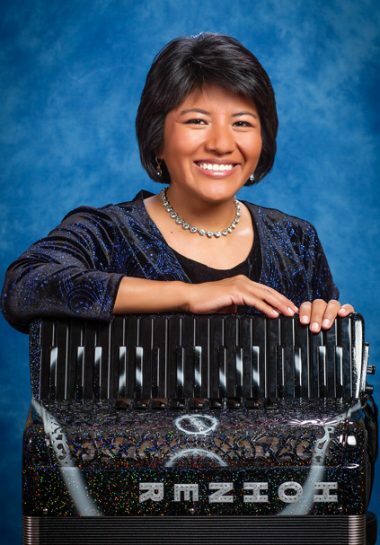 You will not feel alone or question if you’re on the right track because our Accordion Life teachers are on hand available to make sure the beginning of your journey is totally successful. Access to all past archives of the Digital Accordion Magazine: Accordion Life Today. Fill out the information to create your account and get immediate access. Beginners: Start with the Preliminary Course and advance through the levels chronologically. Got experience? Jump to the area you need. Learn how to play new songs, develop good technique and show off your new hot accordion skills. What size of accordion do I need for these courses? For Level 1 and Level 2 courses, you need at least an accordion with 48 buttons. For Level 3 course, you need at least a 72 bass accordion. An Accordion Life Student membership is $29 per month. You can cancel anytime. The same day you sign up and pay $29 will be the same day your membership will renew each month until you cancel. What if I already have experience? Will this program work for me? Yes! Many of our members find that even with experience they learn so many valuable lessons inside Accordion Life that they were never taught. Some will skip to Level 2 or 3 to start and some will watch through Level 1 just to make sure they have their foundation strong. You can always jump to Level 3 Course if you find the songs too easy for where you are. When you want more advanced technique and lessons – we offer private Skype lessons. Are there any sample videos I can watch before I become a member? Yes! You can cancel anytime. Your membership is only month to month. What if Level 1 is too easy? Can I skip to Level 2 or 3? Yes! If you find level 1 too easy you can start with Level 2 or begin in the middle of Level 2 or move to Level 3. After I complete Level 3, am I ready for private Skype lessons with you? You can do Skype lessons with us anytime regardless of what Level you are currently taking on Accordion Life. When you take Skype lessons with us, you will have still have access to all the courses. I have a Roland FR 1X. Can I use it to learn from the course? Yes! You can use a digital accordion or an acoustic accordion – as long as it has at least 48 bass buttons. If you have any questions or concerns about the course please contact us.